Is Chemed Corporation (CHE) Going to Burn These Hedge Funds? Chemed Corporation (NYSE:CHE) was in 15 hedge funds’ portfolios at the end of the third quarter of 2016. CHE investors should be aware of a decrease in hedge fund interest in recent months. 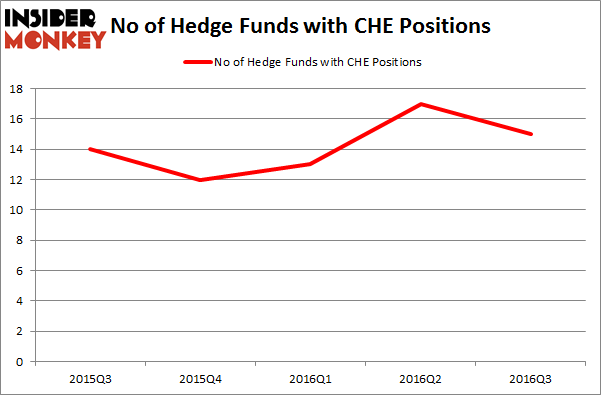 There were 17 hedge funds in our database with CHE positions at the end of the previous quarter. At the end of this article we will also compare CHE to other stocks including Clear Channel Outdoor Holdings, Inc. (NYSE:CCO), WebMD Health Corp. (NASDAQ:WBMD), and Cepheid (NASDAQ:CPHD) to get a better sense of its popularity. What have hedge funds been doing with Chemed Corporation (NYSE:CHE)? Heading into the fourth quarter of 2016, a total of 15 of the hedge funds tracked by Insider Monkey were long this stock, a 12% dip from the previous quarter. Below, you can check out the change in hedge fund sentiment towards CHE over the last 5 quarters, which has generally been within a narrow range. With hedgies’ capital changing hands, there exists a select group of noteworthy hedge fund managers who were upping their holdings significantly (or already accumulated large positions). According to Insider Monkey’s hedge fund database, GAMCO Investors, led by Mario Gabelli, holds the largest position in Chemed Corporation (NYSE:CHE). GAMCO Investors has an $89.7 million position in the stock. Coming in second is Fisher Asset Management, led by Ken Fisher, holding a $77.5 million position. Other professional money managers that hold long positions encompass Amy Minella’s Cardinal Capital, Jim Simons’ Renaissance Technologies, and Joel Greenblatt’s Gotham Asset Management. We should note that none of these hedge funds are among our list of the 100 best performing hedge funds which is based on the performance of their 13F long positions in non-microcap stocks. Here is What Hedge Funds Think About Green Dot Corporation (GDOT) Here is What Hedge Funds Think About Federal Signal Corporation (FSS) Have Hedge Funds Found Something to Love in K12 Inc. (LRN)? 10 Stocks Insiders and Hedge Funds Are Crazy About (part 1) Federal Realty Investment Trust (FRT): Are Hedge Funds Right About This Stock... Should You Avoid Graham Holdings Co (GHC)?